Maplewood artist, Margaret Keller, was recently awarded a commission by Critical Mass to create an public art work and installation for the St. Louis Gateway Arch grounds. 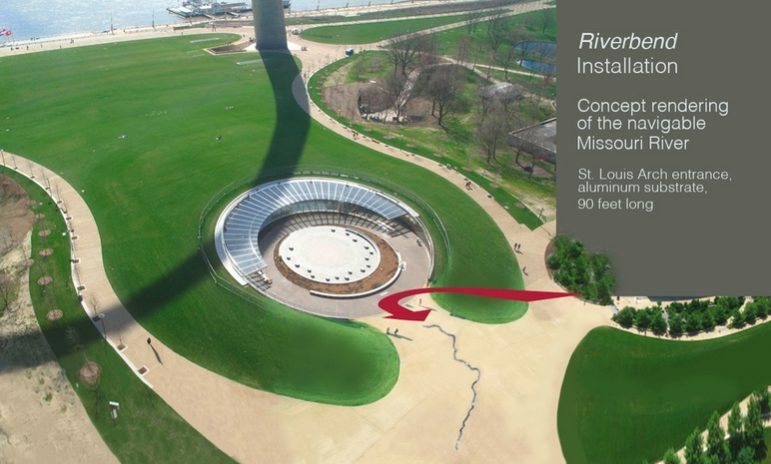 The installation, Riverbend, will represent the navigable Missouri River, under the Gateway Arch. It will be approximately 90 feet long x 25 feet wide overall, made of aluminum substrate, according to Keller’s website. 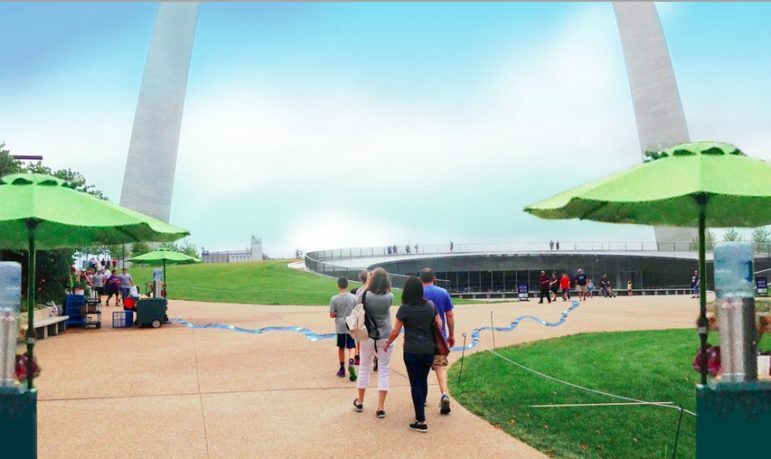 It will be completed on September 21- 22 and open to the public outside the entrance to the new Gateway Arch Museum and be on display thru early December. Rick Puller, a retired history teacher and long-time resident of Maplewood brought this to the attention of 40 South News. Photos from Margaret Keller’s website. Yes, the artwork will show the Missouri River, which is known as the Gateway to the West, since the Missouri River was the route west for the explorers Lewis and Clark and also for the settlers who followed. The Gateway Arch commemorates this Missouri River route. Since the confluence of the Missouri is just north of St. Louis, our city is known as the Gateway to the West too. The true `Gateway West’ was the Missouri River (and its many tributaries) long before settlers took to the Santa Fe and Oregon Trails. The artist is reflecting this in her work. 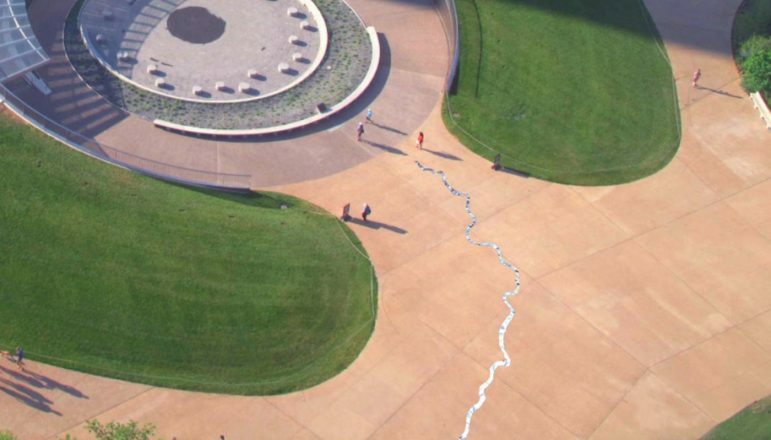 It is a linear sculptural abstraction of the Missouri, a silver highway reflecting in all its twists and bends; a visual metaphor from which so much migration, commerce, settlement, and struggle has been realized. The Mississippi, Ohio, and Illinois Rivers converge and feed into this nexus of greater St. Louis connecting the continent from the Appalachian to the Rocky Mountains. The Arch is a viewfinder from which our geography and history may be re-imagined for the 21st century. Clearly the artist knows the orientation of the Mississippi. 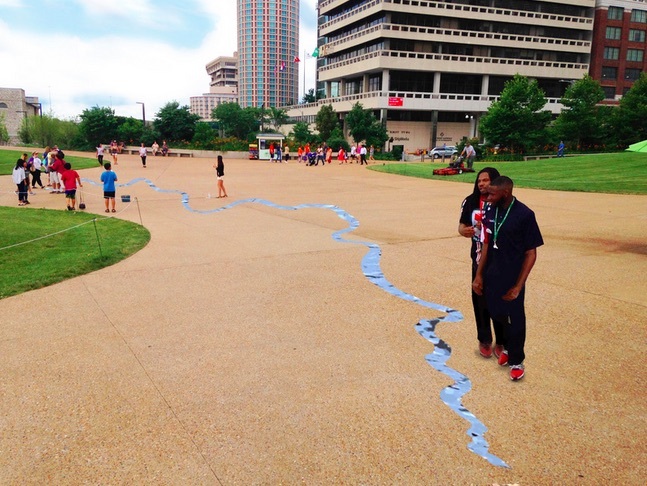 This is why her installation will be oriented west-by-northwest (perpendicular from the Arch) and north to south. You do realize that is the Mississippi Ti er under the Gateway Arch?